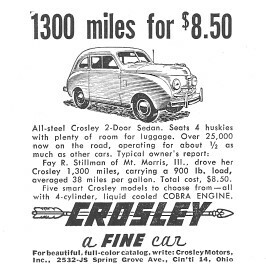 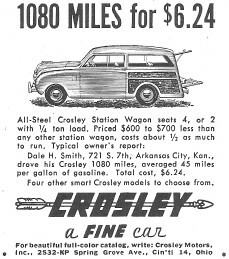 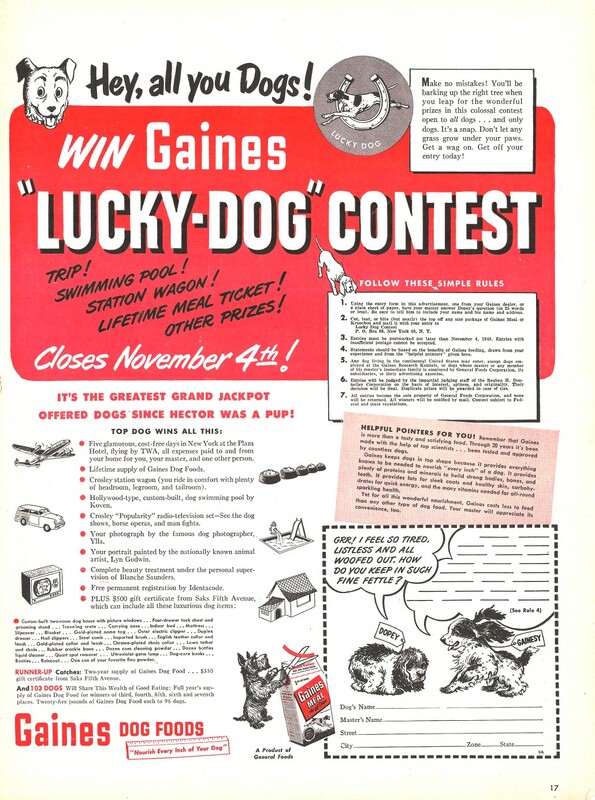 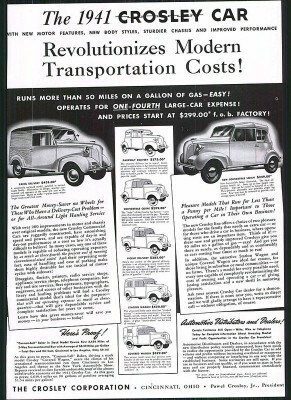 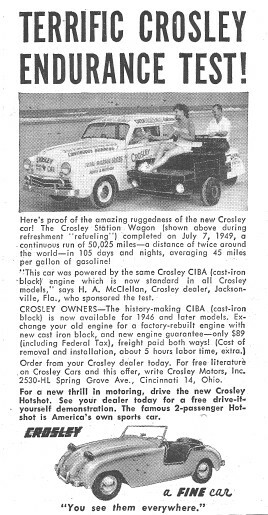 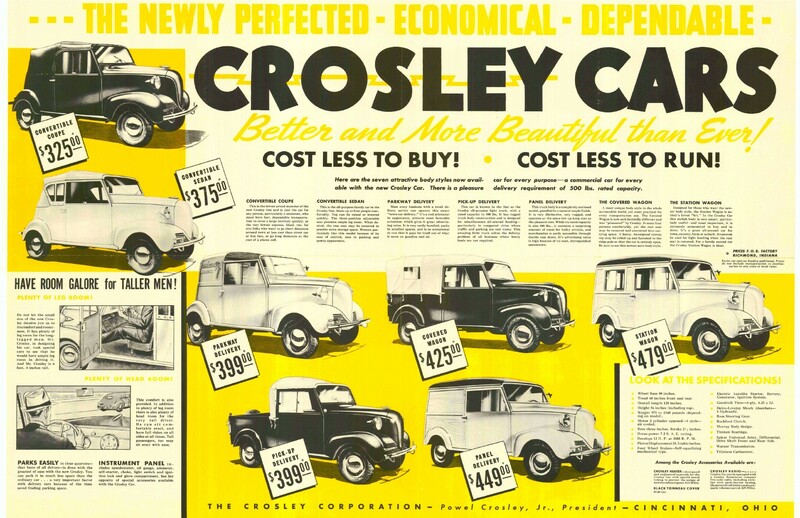 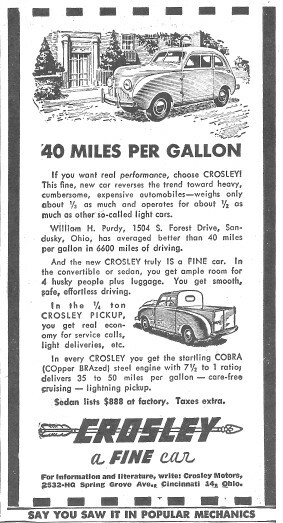 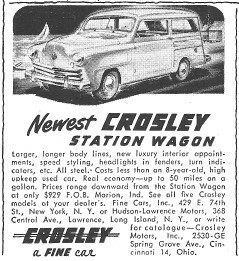 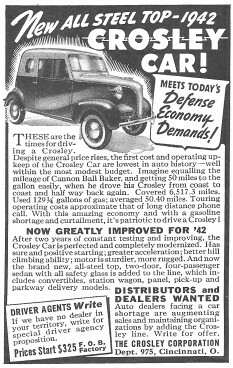 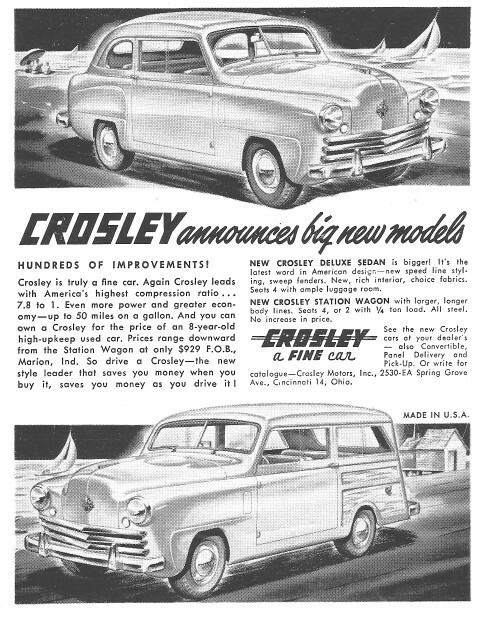 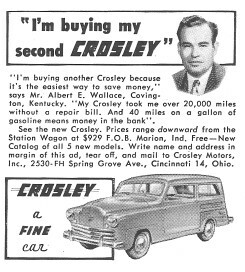 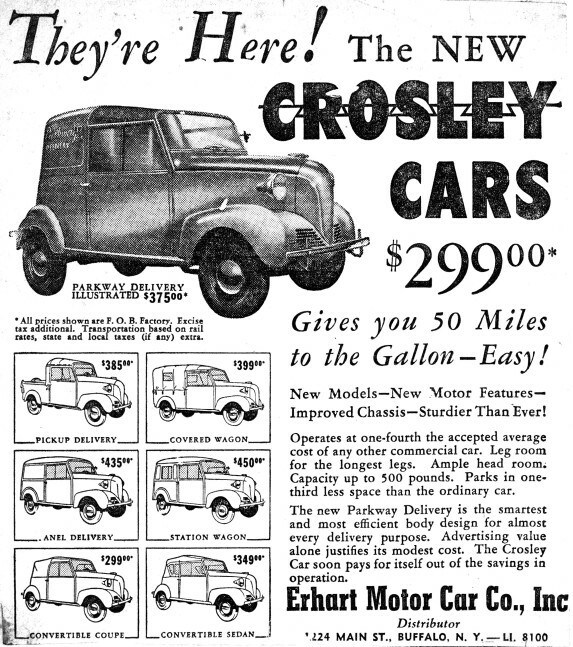 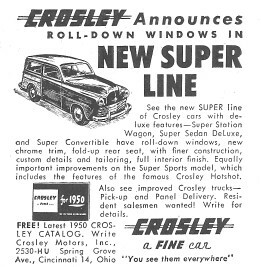 A few years ago I purchased a large collection of Crosley car advertisements off the internet. 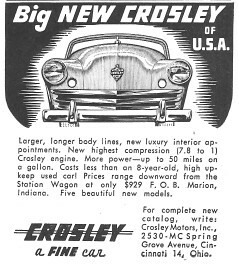 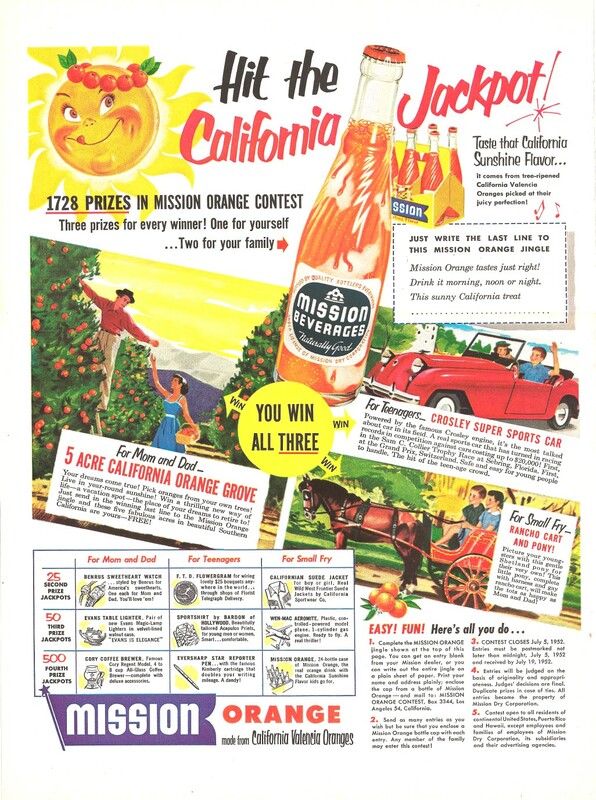 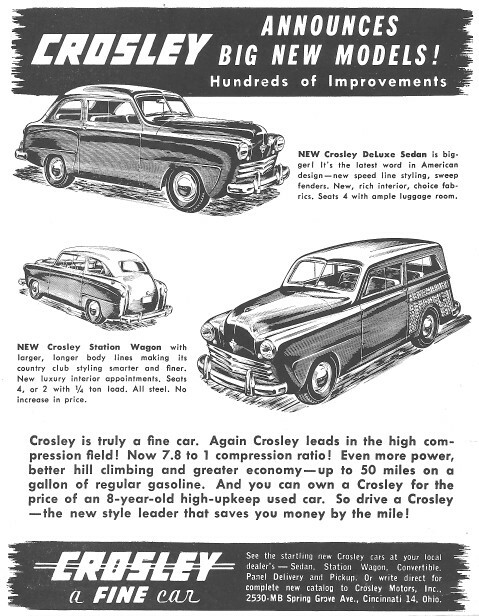 Somebody had meticulously clipped and saved entire pages from vintage magazines featuring ads for the obscure Crosley automobile. 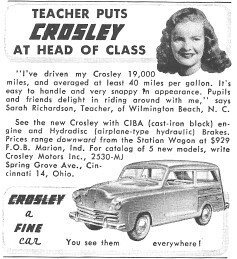 In honor of that anonymous obsession, I have scanned samples of all the ads and catalogued them below. 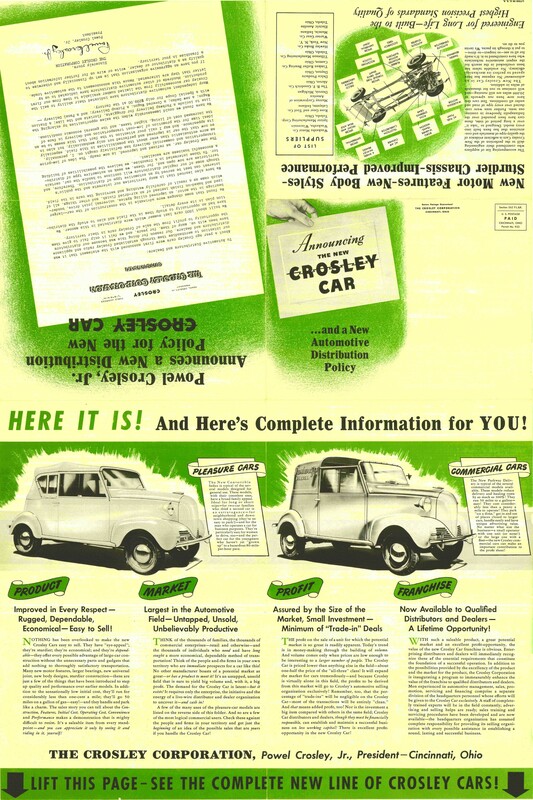 Click on any image to view a larger picture. 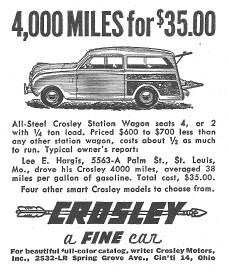 Best viewed on a desktop web browser with the window set wide as possible. 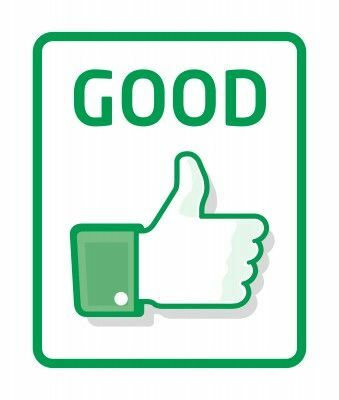 If your browser shows tiny arrows in the column headings, you can click those to sort the table. 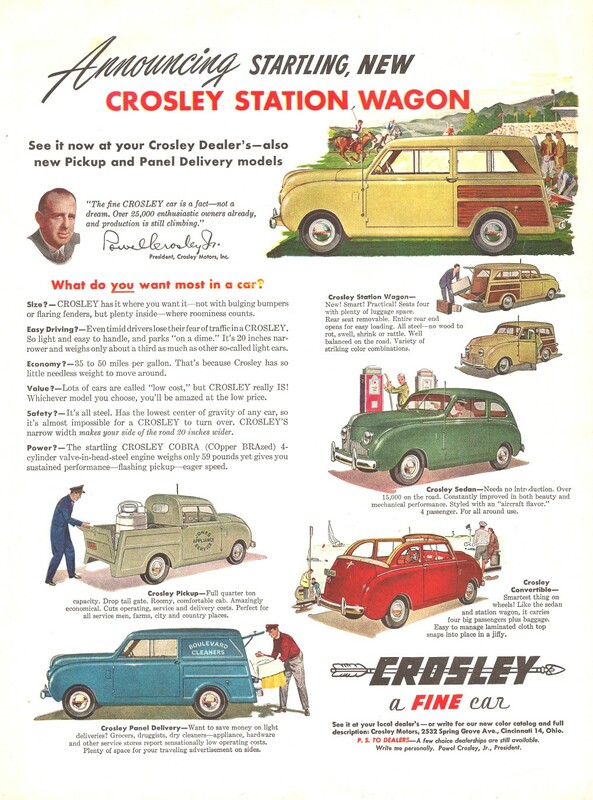 Want your own Crosley ad collection? 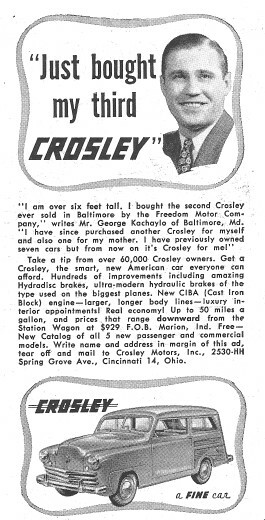 I have extra copies of many of these. 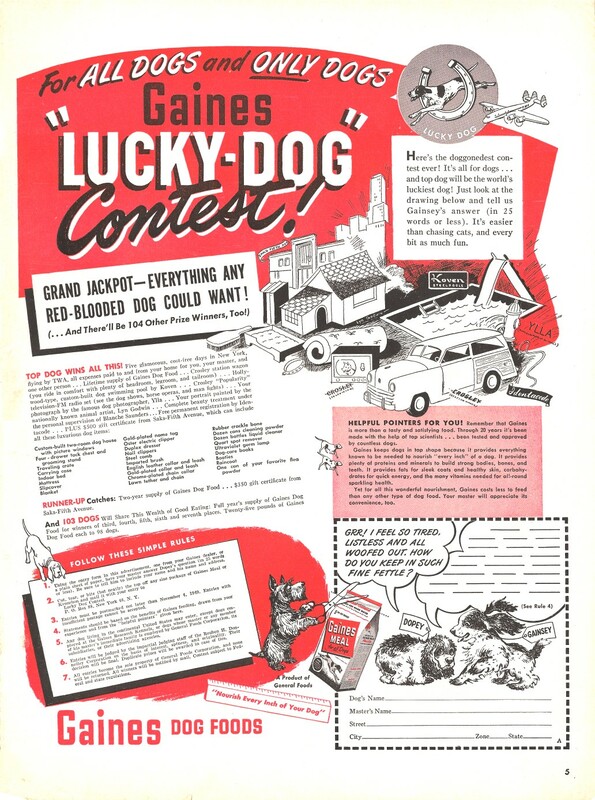 Contact me with the Category code you want. 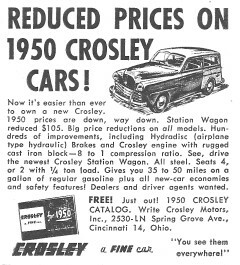 Cost is $5 for the first ad including shipping, and $2 per additional ad. 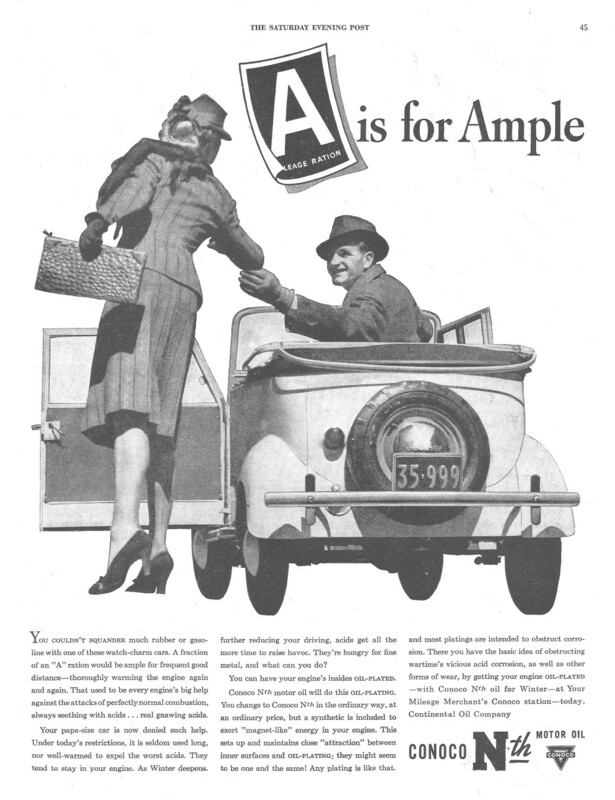 start living” Cartoon of psychiatrist giving advice to woman. 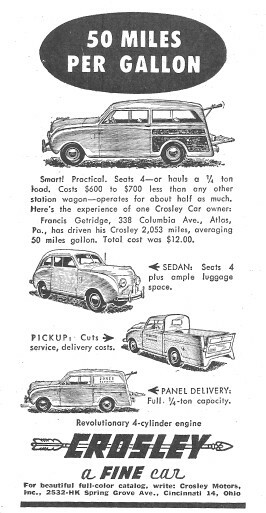 convertible, panel delivery, sedan, pickup, and sports utility. 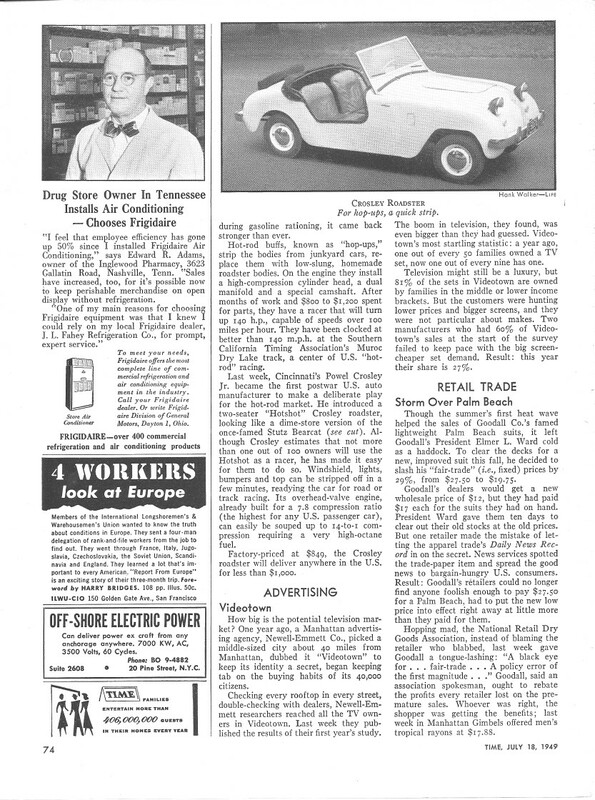 Cites R.P. 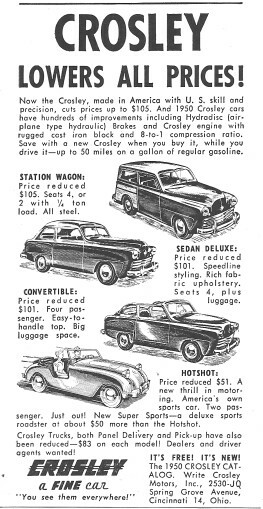 convertible, panel delivery, sedan, pickup, and sports utility. 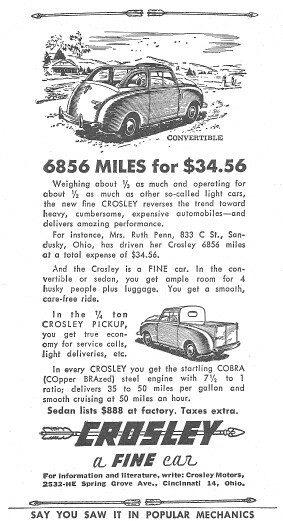 Cites Ray L.
smaller pictures of convertible, panel delivery, sedan, truck. 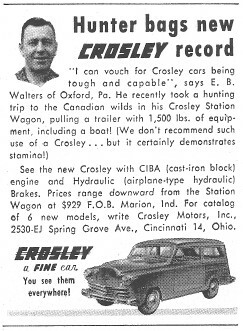 Cites T.W. 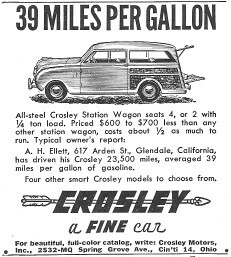 MPG39 39 Miles Per Gallon Drawing of station wagon with chome nose. 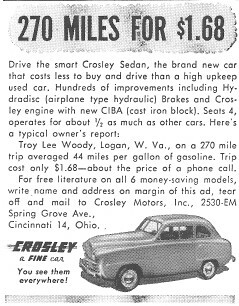 Cites A.H.
Miles270 270 Miles for $1.68 Side 2/3 view of sedan. 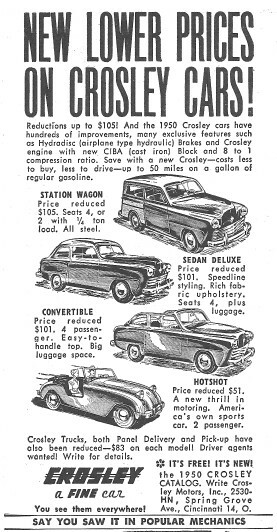 Mentions CIBA and Hydradisc. 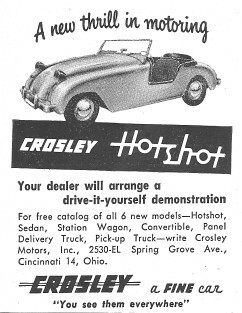 Hotshot. 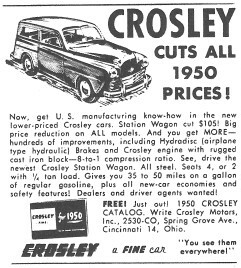 Touts up to $105 price cut, Hydradisc, CIBA, 8:1 compression. 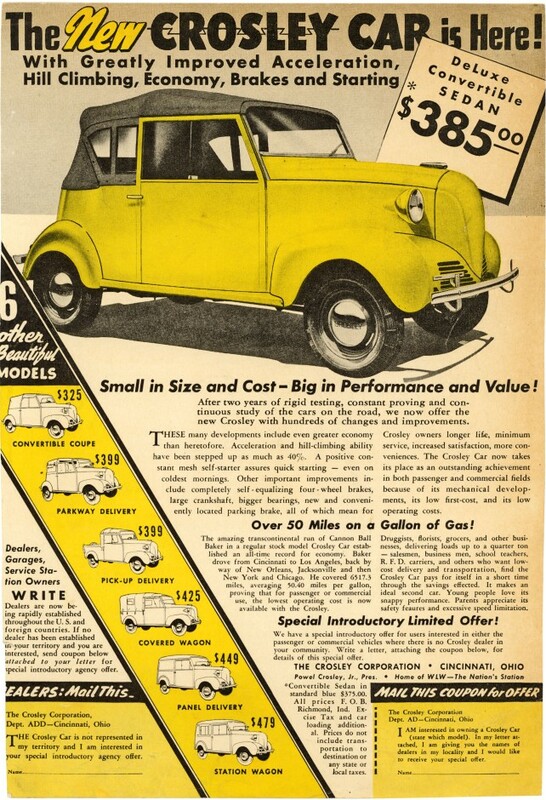 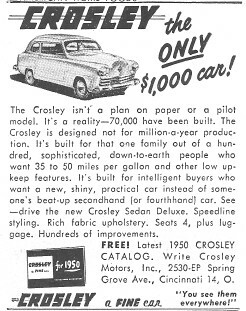 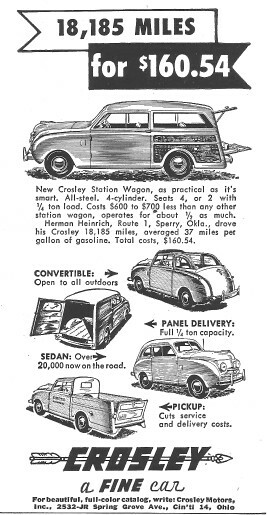 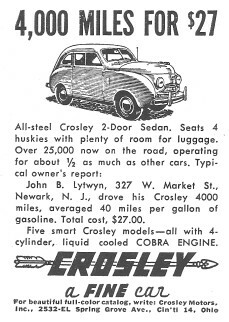 Only1000 Crosley the ONLY $1,000 car! 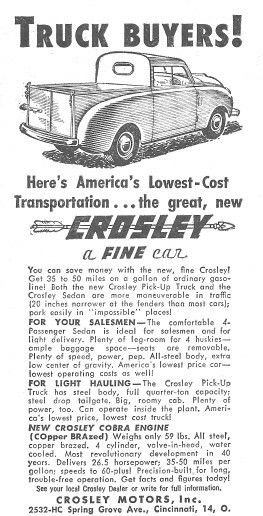 Grayscale front 3/4 illustration of sedan at top. 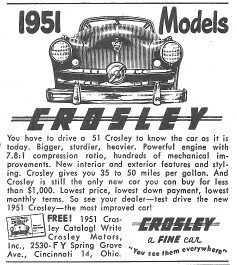 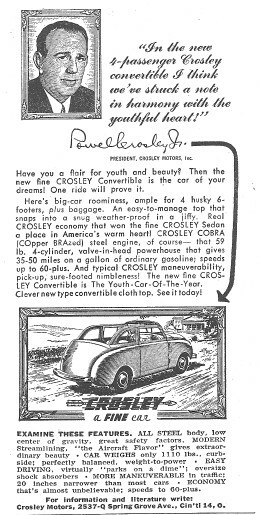 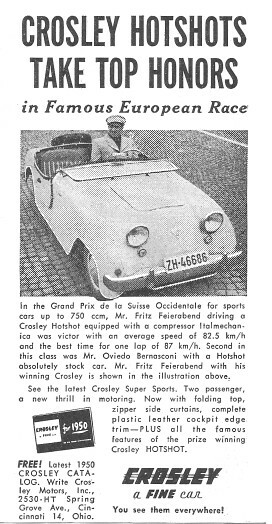 “for teenagers” is a Crosley Super Sports Car, illustrated in red.